Why do I encourage all my friends to play golf? Why have some succumbed to the spell? Golf is not what it seems. Golfers are not, as a majority, male beer-belly smokers. These are the guys that loiter in the golf club houses and restaurants instead of being on the course! 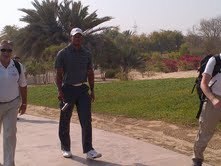 Golf is played by all types of people: young, junior, senior, fit and unfit, eternal beginners and super pros. The fun part is that everyone can play together, mingle the ages and levels and you still get a game! 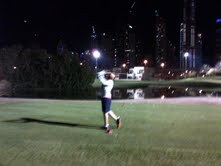 Dubai is the place to golf! Seize the opportunity. There is no requirement to become a member of the luxurious courses. There are so many clubs to choose from. The courses are at our doorstep, very centrally located and further away ones are certainly destination places! 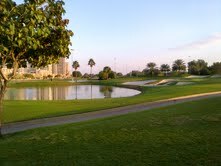 Learn how to play golf now and you will be certain to remain fit all your life. What other sport can you practice when you are retired and old? I have a brother who converted to Golfmania.Hes a strong 70+,who meets with his septuagenarian group in different spots of the universe,several times of the year.They leave their grateful wives home and disappear into the wilderness of the most beautiful courses of the world.This comradely unions I believe are so good for them that I may envy them for being so shellfish .